The accommodation consists of three spacious ensuite bedrooms and each is equipped with tea/coffee facilities, heaters and fans and can be offered on a room only basis. – please see rates under ‘Check Availability and Book Online’. Room 2 - is a queen double bed with ensuite bath, shower and toilet. This room also has a small SABC TV. 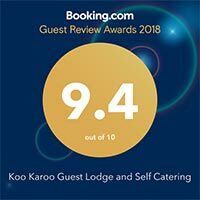 Room 3 - is a king double bed with aircon and is ensuite with bath, separate shower cubicle, toilet, fridge, DSTV (30 channels) and overlooks the garden. The guest lounge is comfortably furnished and provides DSTV where guests can enjoy a complimentary glass of Montagu Muscadel.